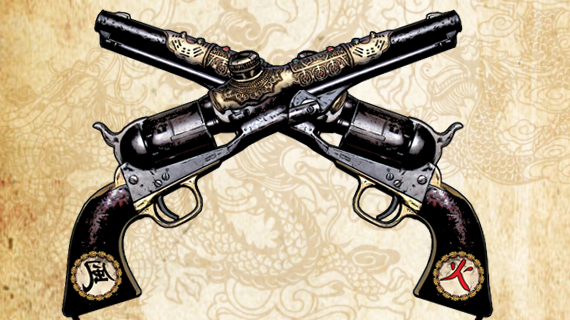 Some of you may recall that when I reported on the announcement of the new game, Far West, I got very excited about the concept of a Wuxia-Spaghetti Western mash-up. As I am wont to do when something in gaming excites me, I abused my position at RPGamer to get in contact with its creator and have a chat with them about their ideas. But because I'm not so completely selfish about how I abuse my powers, I did record the conversation which you can listen to. In the file you can hear myself and Gareth palaver about steampunk, how you blend two similar but distinct genres, this new game's mechanics, the power of Kickstarter and an exclusive announcement from beyond the 8th dimension. Those links he mentioned were Into the Far West for the blog and you can take a look at the game's Kickstarter page at this link.